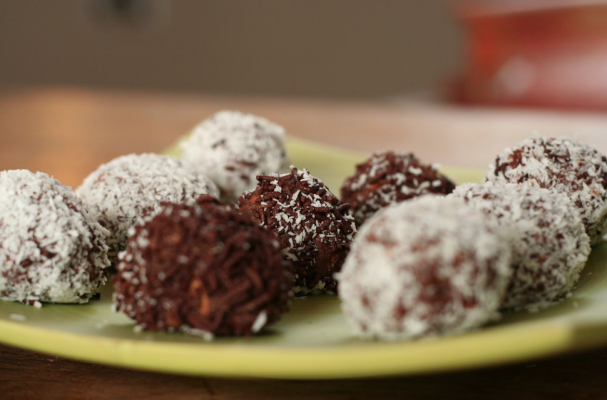 Chocolate dipped puffed quinoa balls are a light and healthy dessert that satisfy your sweet tooth without the guilt. Like popcorn or rice, puffed quinoa is a lighter version of the champion superfood. The seeds become crisp and have an unmistakable nutty flavor. You can make puffed quinoa yourself by toasting it in a low degree oven, about 225 degrees Fahrenheit, or you can purchase it already puffed from a health foods store. This recipe combines the puffed grain with almond butter and honey and then dipped into dark chocolate. Step 1: Heat a dry saute pan over medium heat. Add the almonds the pan and begin to toast them. Once they become fragrant and turn golden brown, remove from the heat immediately, about 5 to 7 minutes. Allow to cool slightly and then roughly chop them. Step 2: In a large mixing bowl, combine the almond butter, honey and vanilla. If the mixture is too firm, heat it up in the microwave for 15 to 30 seconds. Add the puffed quinoa and toasted almonds and stir to combine. Step 3: Place the quinoa mixture in the fridge for 15 minutes to let it firm up. Once chilled, divide the mixture into 12 and roll into balls. Return the balls to the fridge for another 15 minutes before serving. Step 4: Meanwhile, melt the chocolate in a double boiler. You can also do this step in the microwave in 30 second intervals, making sure to stir the melted chocolate between each interval so that it does not burn. Step 5: Line a baking sheet with parchment paper and set aside. Dip the balls into the melted chocolate and place them on the parchment paper to set. If using, garnish the balls with a sprinkling of unsweetened shredded coconut.